The Predators beat the Jets 4-0 in Winnipeg tonight to fight off second-round elimination and force a Game 7 back in Nashville. It was a mostly tense game despite the final, with the danger of a two-goal lead particularly looming over the Preds when the Jets had an early third-period power play. But it was Filip Forsberg who carried the Predators out of Manitoba, adding a couple more pretty goals to his playoff highlight reel and proving that he’s simply too cool to get knocked off just yet. Forsberg’s first was one from my personal favorite genre of goal: the out-of-control breakaway that knocks the net off its hinges. Immediately after grabbing a new stick from the bench, Forsberg received a long pass out of the Predators’ own zone, accelerated towards net, and fought through a Ben Chiarot push to give Nashville a 2-0 lead. The second, which relaxed all of Nashville, didn’t have as nifty a build-up. 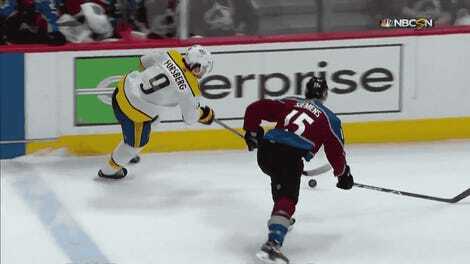 But when Forsberg got the puck on his backhand in front of net, off a pass from behind the net by Victor Arvidsson, he knew exactly what to do, and he did it with style, going between his legs for the finisher past Connor Hellebuyck. There’s even more where that came from, if the Predators get their way. The two best teams in hockey play their well-deserved Game 7 on Thursday, in front of a sure-to-be rowdy Nashville crowd.